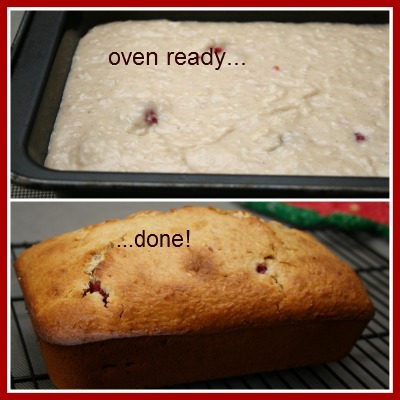 This Recipe for Raspberry Bread makes the best homemade loaf of bread made with fresh or frozen raspberries and dessicated coconut. 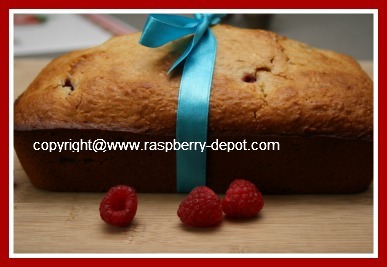 If you are looking for a great raspberry loaf recipe, you have just found a great choice here! 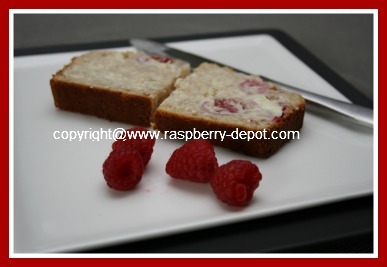 The gentle tartness of the raspberries and the rich taste of the dessicated coconut combine wonderfully in this delicious quick-bread recipe. I find that coconut is one of the most fragrant ingredients and adds texture and flavour to this recipe. Note - if you wish to use frozen raspberries for this recipe, thaw them in a sieve prior to baking, and discard the excess liquid. This will help prevent the loaf of bread from becoming too "wet". In a medium size bowl gently whisk the eggs and add in the milk and the vanilla, continuing to whisk. In another larger bowl whisk together the flour, baking powder and the cinnamon. Mix in the sugar and the dessicated coconut and stir until combined. Make a "well" in the center of the dry ingredients, and gradually stir in the egg mixture just until combined. Add the melted butter and stir until the mixture is smooth. Pour batter into a 8" x 4" (approximately) greased (I use non-stick cooking spray) baking loaf tin. Bake at 350° F for about 55 - 60 minutes, or until a toothpick inserted in the center comes out clean. Allow bread to cool in pan for about 5 minutes, then turn out onto a wire rack to cool completely. Slice when cooled, and serve plain, or with butter and (if desired) jam. Yield: 1 large loaf of delicious bread made with fruit. 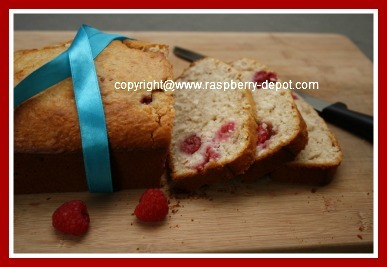 Enjoy this ScRuMpTiOuS Raspberry Bread!